Berlin — June 14, 2016 — The leading full stack ad technology platform Smart AdServer has selected Lasse Nordsiek to drive the company’s development efforts in DACH. Smart AdServer, the leading European full stack ad technology platform dedicated to publishers, has appointed Lasse Nordsiek as Country Manager to strengthen its position in Germany, Austria and Switzerland. He will begin identifying prospects and acquiring new customers in June. Lasse will lead operations in DACH from the company’s Berlin headquarters. Before switching to Smart AdServer, Lasse was Director of Strategic Sales at the DMP provider The ADEX. Lasse has been active in the online advertising business for the past twelve years, eight of which during he held key positions at AOL, Lycos, HiMedia and the retargeting specialist Next Performance. Partners, customers and prospects will have the opportunity to meet the new DACH Country Manager while he attends the Cannes Lions International Festival, held in Cannes, France from June 20—24. Meetings with Smart AdServer will be held aboard the Quasar yacht, which will be anchored at Jetée Albert Edouard. Lasse will also attend Dmexco, the Digital Marketing Exposition and Conference which will take place on September 14 and 15 in Cologne, Germany. Smart AdServer is the only independent full stack ad technology platform in programmatic and direct sales dedicated to the sell side. Our unique holistic approach gives control back to publishers allowing them to innovate and optimize all their monetization channels across all formats – display, rich media, native and video – and on all screens. 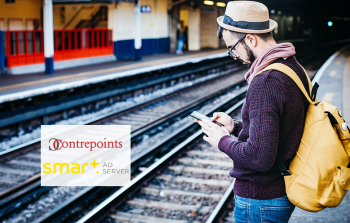 With offices in 9 countries and 150 passionate employees, Smart AdServer empowers more than 600 publishers and ad networks worldwide by delivering ads to 30,000 sites and apps, including Genesis Media, Axel Springer, Le Monde, Wine Enthusiast and Ozy.com.